New Mexico is one of the most beautiful destinations in the nation, and it’s not difficult to see why! The region’s immense beauty, rich history, and wide variety of unique cities offer something for every traveler to enjoy. Whether you’re in search of your next outdoor adventure or a relaxing escape from reality, New Mexico is the place to be! While cities like Santa Fe and Albuquerque are usually the go-to vacation spots, we encourage you to not overlook the hidden gems of New Mexico. One of these mostly unknown treasures is Chimayo, a quaint New Mexican village steeped in culture and tradition. Located just 30 minutes north of Santa Fe, our charming destination offers its visitors a raw and fulfilling Southwest experience. So without further ado, let us introduce you to one of the most unique places to stay in New Mexico, Chimayo! Planning an escape to one of the most unique places to stay in New Mexico? Request your free copy of our Vacation Guide and you’ll instantly receive a downloadable list of our area’s top places to see and things to do. From local hiking trails to highly-renowned restaurants, you’ll find it all! It’s the only thing you’ll need to plan the ultimate getaway to the best place to stay in New Mexico. Chimayo was founded at the end of the 17th-century by Spanish settlers in search of a fertile valley. The land was nourished by the Santa Cruz River and protected by surrounding foothills, making it ideal for their needs. These settlers became experts in farming, raising stock, and blanket weaving. To protect themselves from nearby threats, the villagers built the fortified plaza of San Buenaventura. This is now the last surviving fortified plaza in the United States! Many of the people who reside in Chimayo today are the descendants of the land’s original settlers. They continue to practice the traditions for which Chimayo became famous including weaving, growing fruit orchards, producing red chile, and horse and sheep raising. 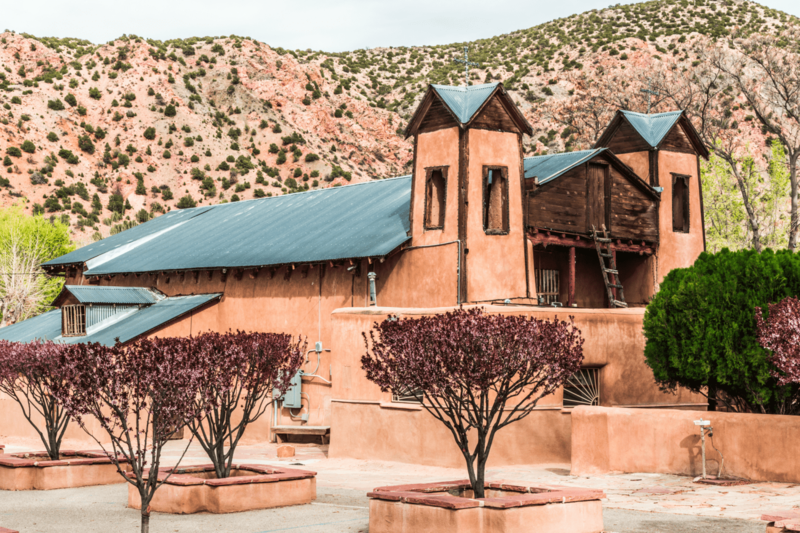 While you’re staying in New Mexico, a visit to the El Santuario de Chimayo is a must! This legendary Catholic church is one of Chimayo’s most treasured locations because it was the site of an incredible miracle many years ago. According to the legends, a wooden crucifix was spotted on the night of Good Friday in 1810 and delivered to a nearby church several times. However, the crucifix would unexplainably reappear right where it was found. The El Santuario de Chimayo became the final resting place for this miraculous crucifix. Since then, it has also become the site of a massive pilgrimage each Holy Weekend. People from all over the nation travel on foot to the El Santuario de Chimayo to thank the Lord for their many blessings, ask for divine intervention, and gain a handful of Chimayo Holy Dirt, which is said to contain incredible healing powers. During your visit, you’ll be welcome to explore the grounds of the church, attend mass, or purchase some holy dirt for yourself! Chimayo is one of the most historic locations in New Mexico! Therefore, there are plenty of stories and centuries-old artifacts to discover. The Chimayo Museum is dedicated to educating the public about the rich history of Chimayo through several collections, special events, and a community preservation association. The museum is also housed in the Ortega Home where the world-renowned Ortega family of Chimayo weavers resided. 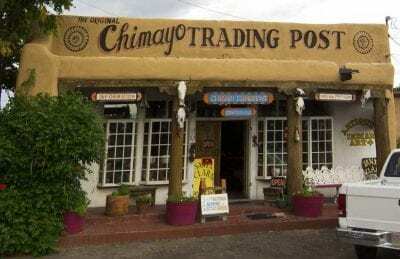 You won’t find your typical mall stores in Chimayo! In fact, a majority of the shops here are unique to our destination. The El Potrero Trading Post is the perfect place to find authentic food products, famous Chimayo chile powder, jewelry, folk art, and much more! If you’re interested in Chimayo’s famous blankets, you’re sure to find just what you’re looking for at the Centinela Traditional Arts. These Mexican-inspired tapestries are full of color and personality, making them the ideal gift or addition to your home. Another factor that makes Chimayo one of the best places to stay in New Mexico is a local treasure known as the Rancho de Chimayo. For over 50 years, the restaurant has served tasty New Mexican cuisine rooted in ancestral family influences. It’s also one of our area’s most awarded eateries and has been credited with playing an integral role in the bringing of authentic New Mexican food into the international spotlight. You won’t want to leave without getting a taste of their sopaipilla relleno, platon especial, or one of their succulent cocktails! While you’re here, why not take a day trip to other small town gems in New Mexico? Here are just two of our personal favorites that offer a nearly endless list of things to do and experience. Located approximately an hour and a half from Chimayo, Jemez Springs is one of New Mexico’s most historic towns. The land was originally inhabited by the Pueblo of Guisewa thousands of years ago. Much like Chimayo, many of the town’s residents are descendants of these ancient Indians. There are also many geological and cultural artifacts that still stand today, making it a must for history buffs! During your day trip to Jemez Springs, you’ll definitely want to stop by the Jemez State Monument or rejuvenate your mind, body, and spirit in one of the town’s natural hot springs. Taos, NM was originally known as the fabled “City of Gold’ by Nomadic tribes. While these rumors have long been put to rest, the town’s natural beauty and plethora of things to do are now considered to be the real treasures of Taos. The artsy town in New Mexico has inspired several great artists, including Georgia O’Keefe and Aldous Huxley. If you’re an outdoorsy person, Taos is also well-known for world-class skiing and incredible hiking trails. It’s a destination you won’t want to leave off your list! While you’re there, you won’t want to skip visiting the ancient Taos Pueblo or taking a stroll through Taos Plaza. A one-of-a-kind getaway to New Mexico calls for a unique place to stay! Meaning “hidden house” in Spanish, Casa Escondida definitely lives up to its name! Unlike other hotels in New Mexico and Santa Fe, our Chimayo bed and breakfast immerses guests in the culture of the Southwest with authentically-designed guest rooms, traditional New Mexican breakfast items, and a naturally beautiful setting. It’s the perfect home base for family vacations and romantic weekend getaways in New Mexico.